What is plaque psoriasis is a common question from people who have this condition. Many people have the idea there is just one type of this disease, but this is not true. Like many other kinds of conditions, there are different types of this skin disease, with plaque psoriasis being the most common form. As is the case with other forms of the condition, the cause is not known. According to studies, the same genetic and environmental factors play a role. According to the National Institute of Arthritis and Musculoskeletal and Skin Diseases (NIAMS) approximately 4 million people have this type of psoriasis. This accounts for more than 50 percent of the over 7 million people in the USA living with the condition. Worldwide those figures are nearly the same. Another way to answer the question, what is plaque psoriasis, is to explain what the symptoms are and how they differ from the symptoms of other types such as inverse or pustular. With this type, small raised areas of skin develop which over time join together to form plaques, hence the name. These scaly, shiny patches of skin tend to get worse under certain conditions or due to triggers. They can become red, extremely itchy and painful. Any breaks in the skin can cause bleeding and infection can set in. The most common sites for this type of the skin condition are the knees, elbows and the scalp. Experts believe that approximately 50 percent of people with plaque psoriasis will eventually develop scalp psoriasis. At its worst, this type can affect almost the entire body. 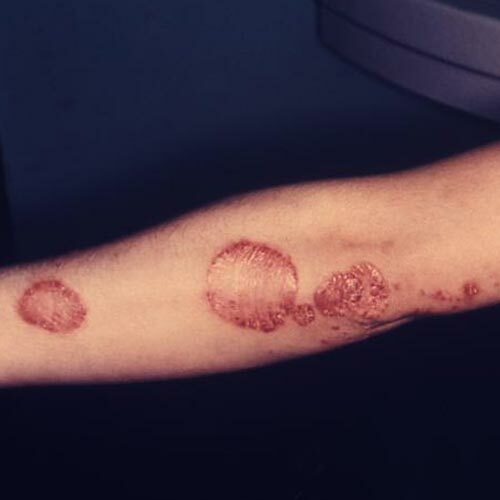 Interestingly, sufferers do not have all the types of this skin disorder at the same time. One type of the condition will clear up and then another will break out. However, whether or not you can answer the question, it is important to know that it is not contagious. This is important in preventing discrimination against people with this common skin condition. Some people get the wrong diagnosis, with the most common misdiagnosis being eczema. If a doctor is unsure of what it is, they will get a skin biopsy or send the patient to a dermatologist for a diagnosis. The first step in controlling this condition is to keep the skin from drying out by moisturizing it regularly. Moisturizing will also help with the itching and redness common to most people with the condition. Coal tar: This ointment works by retarding or slowing the rapid growth of skin cells. When this happens, the look of the skin will improve. This product is a combination of tar and wood. Some people also use home remedies to help them control the condition. The use of some common bathroom items can help to control the itching. Making a paste with oatmeal and water and rubbing it onto the skin can also be soothing. While getting an answer to the question what is plaque psoriasis is important, to sufferers getting relief from the condition is the most pressing matter. Knowing about the condition makes it easier for sufferers to seek help and learn to control the triggers.